For many of us, our skincare regimen may be something we take for granted. It’s such a staple part of our routine that we may not have stopped to consider where these regimens started. Your daily beauty routine probably dates back thousands of years, and incorporates ancient rituals from cultures around the world. Our skin needs these ancient rituals and ingredients now more than ever with today’s high levels of environmental stressors and pollution. Because ingredients found in nature were the only option in those days, rather than chemicals, the majority of ancient beauty rituals are completely safe and natural. Luckily for us, these ancient beauty rituals have made their way into modern day skincare. And while those in ancient cultures could only use ingredients available in their regions, our globalized world provides us the benefit of so many diverse ingredients being available to us. At Sonäge, we keep ancient beauty rituals in mind and source only the best ingredients that have been used for centuries. Those who created ancient rituals knew a thing or two about beauty, and today people are increasingly concerned about the ingredients they use on their skin – which is why it’s important to go back and re-visit the ancient cultures who gave us these beauty traditions. Tap into the beauty secrets of the past by discovering Sonäge’s modern skincare science, using the healing powers of mother nature. 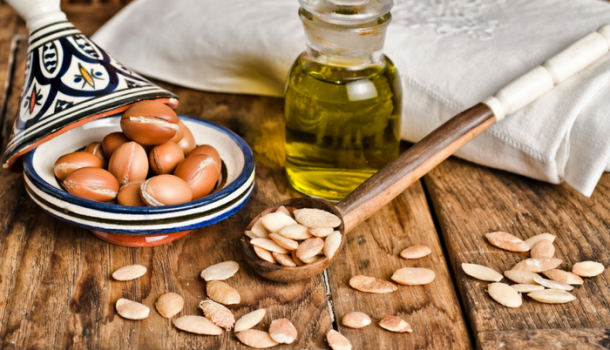 One of today’s most coveted moisturizing oils, Argan oil was an important trade item in the Mediterranean area. It was especially helpful to ease dry skin during hot, and dry Mediterranean summers. Argan oil is also packed with antioxidants, fatty acids and Vitamin E – believed to help reduce the appearance of wrinkles. Because of Argan Oil’s moisturizing and anti-aging benefits, it was also used in ancient Japanese culture for centuries as an aid in facial massage – another anti-aging beauty secret. In combination with a blend of other essential oils in our Vitality Nourishing Facial Oil, it can provide intense hydration and radiance. Ayurvedic skincare was, and still is, derived from the most nutritious herbs and oils available. Herbs like Neem, Tulsi and Turmeric were incorporated into masks and creams – turmeric primarily for its antiseptic properties making it ideal for healing and repairing skin for a luminous glow. Our newest mask that we’re still buzzing about, Tulsi Soothing Tri Clay Mask, primarily embodies the principles and ingredients of Ayurvedic skincare rituals. A calming blend of three rich mineral clays containing Ayurvedic healing herbs, works to reduce excess oil, maintain a smooth, fresh complexion while harnessing the ancient Indian science of self-healing. There’s no better form of self care. The ancient Egyptians are known for being pioneers of beauty, from exotic jewelry and hairstyles to makeup rituals including dark eyeliner and lip colors – they owned the original cat eye. In fact, makeup application was so important to them that it was used as a way to honor their gods and goddesses. Aside from makeup, Egyptians focused on skincare by utilizing moisturizing emollients including Shea butter and Almond oil to protect themselves from a dry, desert climate. It’s been found that they used over 21 different vegetable oils for a range of beauty purposes. Our Lumenez Vitamin Rich Creme was formulated with these ancient rituals in mind, packed with moisturizing emollients to create a rich, restorative moisturizer that provides hydration and a long-lasting glow. One of the most notable figures in ancient Egyptian beauty rituals is Cleopatra. Cleopatra left behind legacies of beauty rituals. Aside from utilizing the Almond oil that was praised by the Egyptians, she also incorporated Apple Cider vinegar into her anti-aging routine, which is often used in DIY masks to tighten the skin. One of her favorite beauty rituals was bathing in milk to keep her skin soft and using Rose water for its ability to serve as a very delicate astringent. Our Hydrating Rinse incorporates both and can be used as a toner for refreshed skin with a subtle aroma. Utilizing a variety of ingredients and aromas, Romans were known for their bathing rituals and opulent bath houses. Inspiring many popular facials of today that incorporate extraction, they utilized steam therapy to purify the skin and metal tools to scrape dirt and sweat from the body. The ancient Greek introduced the wonders of Olive oil to today’s beauty rituals. Originating from the sacred wild Olive tree of ancient Greece, Olive oil was used in anti-aging preparations. It was used to protect the skin from the environment and was used in face masks to promote a clear complexion. Today, Olive oil is still widely praised and utilized in a variety of skincare products. We’ve made it a key component of one of our favorite anti-aging creams, Biosyl Peptide Booster for moisturizing the skin and stimulating skin rejuvenation. Alongside olive oil, Biosyl also touts Pumpkin Seed oil, which was praised by the ancient Greek for softening the skin and helping to maintain a youthful glow with its high Vitamin E content. It runs in the same league as the ever praised coconut oil, but as Fall approaches it can be even more beneficial to improve skin texture.